It’s no secret that all you need to make a really fast, really easy scarf is super bulky yarn and a giant hook. Since bulky yarn is so thick and dare I say it, bulky, it is really fast to make something with it! Not only that, bulky yarn looks great in very simple patterns. You don’t need to show off your fancy stitch work when all you need to do is show off the cool yarn it’s made with. So here is a really fast and really easy crochet pattern to use your really cool bulky yarn on! Start by chaining 87 or a chain as long as you want your scarf. The amount of chains must be an odd number. Repeat row 2 three times or until scarf is as wide as you desire. 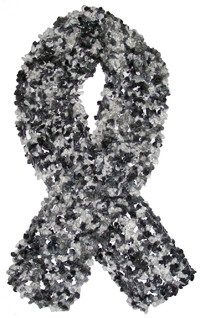 If you need help with crocheting this scarf, let me know by leaving a comment and I’ll be more than happy to help! This entry was posted on Thursday, May 14th, 2009 at 12:00 AM by Rachel Choi	and is filed under Free Crochet Patterns. You can follow any responses to this entry through the RSS 2.0 feed. You can leave a response, or trackback from your own site. I am using a p hook and it is working just fine. Gotta love the fun, bulky, yarns – work up quick & hide not so perfect stitches…and look cute! Thanks for sharing this! I am so glad you posted this pattern. I have a fuzzy yarn that I was not sure what to do with! Yes, you chain 2 more at the beginning of row 1. I love this pattern. I made 3 scarves in one evening. Love to see more of your patterns. I’m very new at this and I’m so confused I have no idea how to double crochet or chain. I can make the first 87 chain, but after that I’m lost. But, I really want to learn how, I’ve been researching it for a couple days now and I can’t find anything for beginners. Help! It contains links to the basic crochet tutorials and stitches. Also, check out the How to Read Crochet Pattens post, after you learn the stitches. Thank you for sharing. After absence of many years from crochet, I made this – loved it 1rst to last stitch. Used a skein of furry yarn and super bulky yarn togetherl Posted pictures and notes on Ravelry.com. do you do what’s in ( ) the length which equals 44 dc OR what’s in ( ) then 44 dc? Hi Donna, you repeat the instructions in the ( ) all the way across the row until you reach the end. When you are done, you will have a total of 44 dc on that row. I am a beginner too. I am going to try this today. Do you count the chain that is on your hook as one of the chains? So when you chain 1 and skip 1, do you just skip the one that is on your hook and dc in the chain right before your hook? Hi Lenora, the loop that is on your hook isn’t considered the chain. If you look at the part that if right before your hook that is the chain. Let me know if you need more help. Ok thanks alot. One more silly question, but I don’t want to get too frustrated when I first start. In the () it says chain 1, skip 1 chain…so you make 1 new chain, then skip one of the chains on your original work and dc on the next one, right? This is not easy for me to imagine, but I think I will once I start. I just made this scarf. I used some super bulky/fuzzy yarn that was a blue/green mix. It turned out beautiful. This is the first crochet project of any size that I’ve actually completed! Thanks for the pattern. I made a scarf in exactly 1 hour and I am not a super fast. I love the look of this pattern with chunky yarn. This is also very easy. Hi Rachel – Thanks for posting this pattern – I was looking for something easy for my first crochet scarf project and chose this one – finished it in a few hours and it looks great! This is my first attempt at crochet and I have completed the first dc, but am now stuck! After I complete the first dc, I chain one then what chain do I insert my hook into for the next dc? I know it says skip one…does that mean on the original chain? I hope this question makes sense… I am trying to teach myself! Hi Pam! Yes, skip one of the original chains. So you will make your next dc after the chain that you skipped. The chain that you skip is next to where you made your first dc. Let me know if you need more help. Thanks Rachel! Once you’ve finished the last row, do you do a special type of knot or anything to end it? There’s nothing special you have to do. Just cut the yarn and pull it though the loop that was on your hook. That should secure the yarn in place. Then you can weave the tail of the yarn into your work. Hi Susan, dc is the abbreviation for the double crochet stitch. Here’s a link to the abbreviation chart if you’re interested: Crochet Abbreviations On that page you’ll also see links to the stitch tutorials if you need it. Does it matter what kind of yarn to use??? Hi Stephanie, I would recommend using the same weight of yarn that’s noted in the pattern, but other than that feel free to choose what you like! I’m alittle confused about the part on row 2 where it says to double in the next double, so do i go through the open space on row 1? Or somewhere else? Hi Sammi, you’re going to make a double crochet into the double crochet stitch on the previous row. It’s the stitch right next to the open space. So after you ch 1, you skip 1 ch (the open space), then double crochet into the double crochet. Do you have to use some type of fuzzy yarn in this pattern? I have no luck using those and find that making a mistake and ripping back is nearly impossible + are too slippery. Just not a big fan of those. Could you tell me some other type that may work? I hope to make scarves for Christmas gifts this season. Thank you for sharing your expertise with the rest of us and for being patient with questions that to some may seem a no-brainer. Everything is easy if ya know how right? Hi Deborah, you don’t have to use fuzzy yarn. You can pick any yarn that has the “super bulky” weight symbol on the package. These yarns are thick so that scarf will work up nice and quickly. I made this and after I was done noticed that it looks like I lost a stitch on the end and it is lopsided. Can I add a border to the end of it to make it look better, or should I tear it out and redo? Melinda, it happens to all of us! I would suggest taking it out and redoing it, although it’s always a pain to do. You can add a border, but I don’t think it’ll fix the lopsidedness unless can make the border lopsided too to counter the part that is lopsided on the scarf. I have been waiting to get off of work all day so i can go pick up some yarn and make this scarf! It’s going to be a gift for my ‘secret santa’ at work. I’m just teaching myelf how to crochet using an old book my mom had and it’s been really fun practicing the different stitches but i’m ready to actually MAKE something. Can’t wait to try this. I’m loving your site! Thanks. I have been working on row 2, but I only have 24 dc because I skipped 1 chain after each dc. What am I doing wrong? Hi Robin, do you have 44 dc on row 1? If so, on row 2, you are basically making a dc in each of the dc on row 1, so you’ll have the same number stitches on each row. You’re not suppose to skipping any dc on row 1, which I think you may be doing. The chain that is between the dc stitches is what should be skipped. Hey so I am loving this scarf but I’m a little confused cause where do you skip on row two and so on, is it after you ch one you skip one and then dc again in the next chain? Sorry im a little confused? Thank you! Hi Liz, on the second row you’re going to chain 1, then skip 1 chain, then make a double crochet into the double crochet stitch on the previous row (not the next chain). The chain stitches will go over the chains on the previous row and the double crochets will be made into the double crochets on the previous row. I tried this with Boutique Changes yarn……it looks lacy and ok….. I, too, was confused by the first row saying chain 2. Thanks for the pattern and the help! Hi Melinda, yes, you are correct! You will double crochet in every other chain. You’re making 1 chain, then skipping 1 chain, then making the double crochet into the next ch. It’ll sort of look like a mesh of blocks. Yes! You can use whatever yarn you prefer. Hi Joni, chaining an odd number is correct. Be careful when you are working row 1 though, it is really easy to miscount when you are skipping chains especially since you are working a long chain. Take your time with it! You should have 49 dc. Remember you are also adding the ch 2 at the beginning of row 1. I love this pattern. It is, fast and easy, to make this scarf. Keep up with the good work. Is there any other, pattern, that fast and easy to make ? Just asking. Will a N 9mm hook work ok?? Sure! Your gauge might be different, so feel free to add more stitches if you need to. Row 1 do I just keep repeating whats in the ( ) or do I repeat the first the part of it to? You’ll repeat what is in the ( ) until you get all the way across the row. when they’re walkin down the hall!! I will make a couple as gifts..Thanks so much”!! Does it kind of look like a grid?